Fantasy Faire 2018 has reached the final weekend of its extended run. Sadly, I’ve not been able to cover this year’s event as much as in the past: a hectic schedule and other elements in my physical world activities have combined to limit my SL availability. While it is the final weekend, for those interested, there is still the opportunity to participate in the Fairelands Quest and obtain a cache of prizes – and a weekend is more than enough time to complete the tasks you’ll face. As with previous years, The House of Garland asks adventurers to come to the assistance of the Fairelands and the Bard Queen in order to bring a stop of the Unweaver’s dark doings. And this time – as the time-honoured saying goes – it’s personal. Also in keeping with previous years, the Quest in a multi-part activity; however it doesn’t need to be completed all at once; you can take a break from things and tackle the adventures over a couple of day if you wish. The first act of participating in the Quest is to obtain a Quest HUD, such a via the vendors at the Fairelands Junction. Two versions are available: the basic L$250 version and the L$350 version which includes a set of costumes for those who wish to get into character. Both also provide an introductory note card which provides enough information to get started. When you have worn the HUD, and if you have not previously undertaken a Fairelands Quest, accept the Experience via the dialogue box that also appears on your screen. You’ll only have to do this once, and it is vital you do so; the Quest will not work if you don’t. If you’ve previously participated in a Fairelands Quest (and have not revoked the Quest permissions), you’ll be automatically accepted into The House of Garland adventure. Locate the Bard Queen herself – she is somewhere in Fairelands Junction, and will give you further information to help you get started. Meet Cheer, the squire who will provide you with company and more. Cheer is an NPC included with your Quest HUD and should be worn with the HUD, but she’ll not become visible until you actually encounter her in Fairelands Junction. Locate the Archetypes in the Fairelands. There is one Archetype per region, and the HUD will help you identify them. Note that Archetypes can only be found in public areas of the regions – they will not be instead any stores. They can also be sought in any order, and each will provide you with further assistance. Travel to Ardessa, the Quest region. You should only do this once you have located all the archetypes. Once in Ardessa, seek the gates within the region in order to progress towards completing your adventure. Note that with one exception, the gates can be sought in any order; should you happen upon the exception before you have found all the other gates, it will simply tell you to seek those you have not found. Unlike more recent previous Quest regions at the Fairelands, Ardessa is a verdant land, rich in flora and fauna, full of the colours of summer. Designed by Éclair Martinek, it offers a wooded and sometimes rugged landscape with many paths to follow and things to discover. As such, it is well worth taking the time to explore, whether or not you are engaged on the Fairelands Quest (if you simply chose to explore, the Quest won’t interfere with you). So while there is still time, why not visit Ardessa, or get your teeth into the Fantasy Faire 2018 Quest? All proceeds from the sale of HUDs go you RFL of SL, and there’s a generous range of prizes to be claimed! The largest fantasy-related event to take place in Second Life, Fantasy Faire, opened its gates to 2018 on Thursday, April 19th, and will remain open through until Sunday, April 29th, 2018 inclusive. It brings together fantasy enthusiasts, creators, performers and designers for eleven days of commerce, special events, and live music concerts, with special emphasis on fund-raising for Relay for Life of Second Life. This year marks the Faire’s 10th anniversary, and presents 15 regions (including the entertainment and Quest regions) to be explored and enjoyed, and a packed programme of activities and events. It also marks the start of a new chapter in the American Cancer Society’s (ACS) work. For the first time, fund-raisers are allowed to earmark donations for a special project they have chosen to support – and Fantasy Faire is the flagship event to launch this new approach within virtual worlds. As I was able to report earlier in April, all funds raised during Fantasy Faire 2018 will go towards to development and operation of a new Hope Hostel to care for cancer patients and their care givers, at the Kenyatta National Hospital, Kenya. Once again, the Faireland regions offer an impressive range of realms and ideas, from what might be regarded as “traditional” fantasy – we have a former realm of elves for example, in The Bazaar Dungeon, while The Pools of Ethuil echo elven tree-homes – through to and almost science fiction edge to things with Erstwhile, a grand spaceport sitting within the bowl of a flooded crater, great trading space vessels docked along its elevated rim. Elsewhere there are echoes of past Fantasy Faire events. Atherea, for example has a faint visual echo of 2012’s The Tides and a thematic reflection of 2013’s Magnificat. You can find the background notes on all the 2018 Faireland regions here, or by visiting their individual pages on the Fantasy Faire website. Of course, as well as all the best in fantasy shopping, Fantasy Faire offers just about something for everyone. 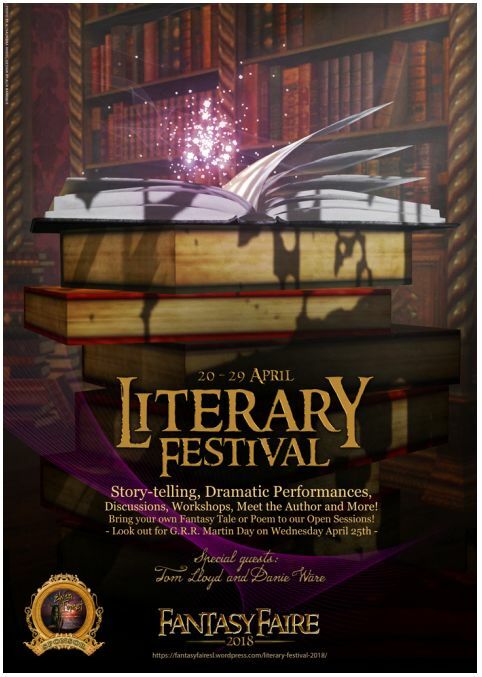 There’s the Literary Festival, which is based at The Halls of Story and which I previewed earlier in April. There is also the Fantasy Faire Quest. Then there are the auctions. The silent auction runs throughout the Faire and there will be details available shortly, while the Live Auction will take place on the final day of the Faire again, watch the Faire’s website for details and a chance to own one or more extremely rare items from this year’s event! Role-Play! Once again there will be numerous opportunities for role-play within the Fairelands. Three groups are offering themed role-play, weaving tales and offering anyone with an interest with the chance to participate. The NeoVictoria Project presents A Visit to Mrs. Chickenstalkers, taking place at Athenaeum Arcana. Find out more via the role-play backstory and by following the Daily Updates once the role-play commences. Sanctuary will be presenting a dark themed role-play located on Severina. While the folks from Escapades Island will be leading the Magpies at the Bazaar Dungeon. But that’s not all! In addition to these three, there is a new role-play feature for Fantasy Faire 2018. The denizens of Luth will have opened an embassy in the land of Severina, where they will be holding a regular series of Meet’n’Greets offering fairelanders can meet their representatives and learn more about their stories. Also new to Fantasy Faire 2018 is table-top gaming! prospective GMs have the opportunity to host a game session (or two), all while raising funds for the American Cancer Society’s Relay For Life. And, of course, there will be the popular role-play classes, this year located at Falls of Hope. See the class schedule for more. Performance and Art: there is a full programme of art and performance events, to be found at The Story Well and Astrid’s Nemeton. Some 37 artists are exhibiting their images at Fantasy Faire 2018, and there will be a range of performances by some of the top dance troupes from across Second Life, including Misfit Dance, the Avilion MerBallet company, the Changhigh Sisters, DRUM, Luxe Girls and more. See the Performance events list for more, including dates and times. A Midsummer’s Night Dream at Astrid’s Nemeton, 14:00 SLT, Friday 20th and 09:00 SLT, Saturday, April 28th. Much Ado about Nothing at The Story Well, 14:00 SLT, Saturday, April 21st and 09:00 SLT, Sunday, April 29th. The April Showers Ball, 18:00-20:00 SLT, Saturday, April 28th at The Story Well. Xanadu Season Finale Roller Party: 18:00-20:00 SLT, Sunday, April 29th at the Fairchylde. Keep Abreast of all things Fantasy Faire – music, auctions, literary, performance, and of course the infamous Jail and Bail rounds – through the Fantasy Faire Website, the Fantasy Faire 2018 events calendar and Fantasy Faire radio. And start your Fairelands journey at the Fairelands Junction. Fairelands Junction – Portals and Memorial Area. Ardessa (Éclair Martinek) – Fairelands Quest. Fantasy Faire 2018 has put out a call to any with experience of being a games master or dungeon master (GM / DM) and running campaigns in any role-playing game system with an emphasis on fantasy, and who would like to tabletop gaming combined with elaborate live-action role-playing/storytelling. GMs can choose from a list of recommended games to host, or they can simply host their own with prior approval from staff. They will have the opportunity to create immersive campaigns that are inspired directly by the Fantasy Faire worlds, or perhaps they can go directly off their imagination ‘on-demand’. Anyone with the requisite experience, and who would like to be part of Second Life’s biggest annual fantasy event all in aid of Relay for Life and the Kenyatta National Hospital Hope Hostel (see here for more) should read the guidelines document, and then complete the form below (also accessible from the guidelines document). There is also a spreadsheet of current programming which can be perused to see what is being planned. Questions and enquiries should be directed to Nyza Stillwater in-world or by e-mail to nyza.stillwater-at-gmail.com. 2018 marks the start of a new chapter in the American Cancer Society’s (ACS) work. For the first time, fund-raisers are allowed to earmark donations for a special project they have chosen to support – and Fantasy Faire is going to do precisely that, supporting the Kenyatta National Hospital Hope Hostel, with all proceeds from this year Faire going towards this ground-breaking international project. Since the 1970s, ACS has built and managed more than 30 Hope Lodge facilities across the United States and in Puerto Rico. These provide free accommodations for cancer patients and their caregivers during treatment. More than a place to stay, a Hope Lodge can be an essential part of cancer care for many. In 2014, for example, over 44,000 cancer patients and caregivers stayed at a Hope Lodge for a total of over 276,000 free nights of accommodation and a range of facilities such as a social centre, library, and laundry. For some of these people, it saved them from facing the impossible choice between receiving treatment and paying the bills at home. 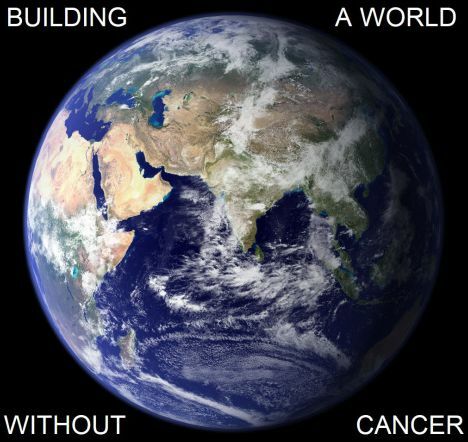 Now ACS has decided to broaden the project and establish Hope Lodges internationally – and the first is being created in Kenya, where cancer is the third leading cause of death. Approximately 40,000 new cases out of the nation’s 45 million population are diagnosed every year, and some 28,500 Kenyans die from the disease annually. What’s more, while cancer mortality rates in developed nations have fallen as treatment and preventative measures have improved, in Africa they’ve remain unchanged for 30 years. Currently, the only public comprehensive cancer treatment centre in Kenya is located at the Kenyatta National Hospital (KNH) in Nairobi. This means patients must travel from all over the country to KNH to receive treatment. However, accommodation is at a premium – many Kenyans simply cannot afford the US $4 or $5 a night cost of lodging while receiving treatment at the hospital. This leaves many patients sleeping in the hospital’s corridors (for which the KNH has been repeatedly chastised) or worse, outside. Exposed to the elements, without the means to bathe or prepare a proper meal, many of these patients have their chances of survival is greatly compromised. Hence why Kenya has been chosen to become home to a Hope Lodge, and ACS have decided to partner with the Kenyatta National Hospital to create it. Located within the campus grounds of the KNH, the Hope Hostel will cost an estimated US $2 million – an amount that will guarantee both the construction of the facilities and cover two years of operating costs. Once operational, the Hope Hostel will serve more than 1,000 cancer patients annually, providing free temporary housing and integrated hospital services, such as post-operative care and pain management. In addition, the Hostel will provide an on-site resource centre where patients and caregivers can obtain cancer information and resources, and offer a place where patients can rest during the day. The KNH Hope Hostel will not only provide people from around the country a place to stay during treatment, but also a place to heal physically and spiritually. Fantasy Faire is taking on this lead role in both raising funds and awareness of the Kenyatta National Hospital Hope Hostel at the direct request of Stingray Raymaker, known in the physical world as Jeff Montegut, the Director of On-line Revenue at Relay For Life. Fantasy Faire has raised so much money for RFL in the last nine years, and I know that 2018 will be huge. Big number TEN and all! So, what do you think about the idea that all money raised by Fantasy Faire in 2018 could go to helping us build the Hope Lodge in Kenya? Relay For Life of Second Life is a global fund-raising activity, but it has often been seen as raising money for an American organisation which spends that money only in the United States. This is not an accurate reflection of things – as Da5id Abbot has recently blogged about on the Fantasy Faire website. Fairelanders, let’s show our new friends just what we can do. Elizabeth Tinsley, Da5id Abbot and Zander Greene.